Cases to keep iPhones in are everywhere, and cases with camera attachments built into them have been around for a good while too, with different kinds of lenses built into cases to make taking things like macro photos easier while also improving the quality of the finished article. 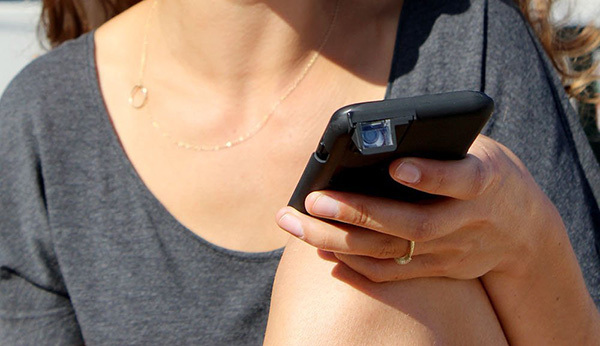 Currently priced at $49.95, the COVR Photo Lens case for iPhone is a little different to some of the other cases you may have seen, because while offering protection thanks to its rubber design, the COVR’s main aim is to make it easier to take candid or spy photos without having users first manoeuvre themselves and their iPhone into position. Now we have covered it previously on two occasions, once for older iPhone models and once for newer, but both times it was only a Kickstarter project. Now though it is a real product, and available to purchase right now. With a retractable lens that reminds us a little of a submarine’s periscope, the COVR makes it easier for people to take photos of their kids playing, for example, because they can take the images in a more natural position. Anyone who’s ever lost the chance to take a candid photo of a child because they completely changed when they saw a photo was being took will know exactly why the COVR Photo Lens case has the potential to be an excellent addition to the long list of cases with camera attachments. Durable Design: Shock absorbent rubber core and hard outer shell give you durability and protection. Great for Candid Photography: Allows you to shoot pictures/video in a much more subtle way so you can capture natural moments easier. More Choices: The COVR case is like having a second camera lens on your iPhone so you can capture a variety of unique looking images. High Quality Optics: Whether you shoot photos or video, the COVR Photo lens gives you great image quality. Available in black and white for the iPhone 6s / 6, the COVR Photo Lens case may not be cheap, but the first time you manage to get the perfect snap because someone didn’t realize they were being photographed will see that $50 be well, well worth it. The case also has a much cheaper iPhone SE / 5s / 5 variant that comes in additional “Sport Blue” and purple colors. Just remember, just because you can take a photo of someone without them knowing or complaining doesn’t necessarily mean you should! The crime of, what exactly? This would be highly useful in the Third-World context where videoing unethical police activity can get one badly beaten. If I was still living back home (Jamaica), I would definitely want something like this. It might be cool to use for timelapses so you don’t have to worry about propping up the phone or even buying a tripod mount for it. But Sachin, If they ban Redmondpie, where else would you go to vetch? Can the protruding thing roll back?